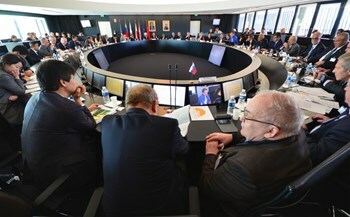 Representatives from the seven ITER Members convene in the Council Chamber for the Thirteenth Meeting of the ITER Council, from 20-21 November 2013. Seven years to the day after the signature of the ITER Agreement at the Elysée Palace in Paris on 21 November 2006, the ITER Council convened for the thirteenth time in its history. Braving an improbable episode of snowy weather, senior representatives from the seven ITER Members convened in the fifth-floor Council Chamber for two days (20-21 November) to discuss Project progress under the chairmanship of Hideyuki Takatsu from Japan. The Council noted that all major contracts for on-site civil works, a crucial milestone for the Project, have now been signed. The seven Members reported that the pace of manufacturing of key components is also progressing steadily within their respective industries. The Council responded to an internal, biennial independent assessment that urged changes in both project management and governance. The Council agreed with the assessment's findings, which indicated that the project faces challenges including schedule delays that need to be addressed immediately. To this effect, an action plan will be presented in mid-January and will be evaluated at an Extraordinary Meeting of the ITER Council in early February 2014. The Council made two important technical decisions, approving ITER Organization proposals to commence operations with a full tungsten divertor and to include the in-vessel coils, which will improve plasma stability, in the ITER Baseline. Click here to view the photo gallery of the Thirteenth ITER Council.